Hot property Jackie Oates, double BBC Radio 2 Folk Awards winner, has been announced for Frome’s first folk festival next February. 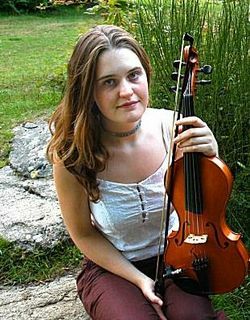 The in-demand fiddle singer has been steadily carving out her career since The Word described her as “an impeccable starlet-to-be”. The Cheshire-born performer, known for her uniquely disarming treatment of English ballads and songs will join a diverse mix of acts at the 2012 Somerset festival including headliners Spiers and Boden and Steve Knightley. Jackie, who will appear at Frome with her band, scooped the Horizon (Best Newcomer) title at the 2009 BBC Radio 2 Folk Awards. She also won Best Traditional Track with "The Lark in the Morning", taken from her second album "The Violet Hour", produced by Show of Hands’ multi instrumental wizard Phil Beer – and one of MOJO’s Top 10 folk albums of the year. 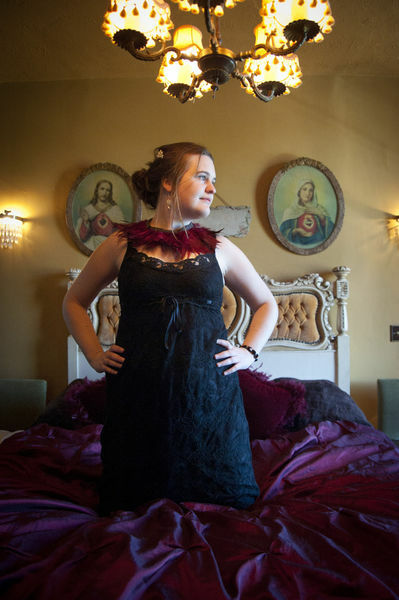 Since then 27 year-old Jackie has been on a roll with her latest album "Saturnine" receiving top media reviews and prompting appearances on programmes from Radio 4’s Woman’s Hour to 6Music’s Cerys Matthews show. Her sensitive, unadorned treatments of traditional songs work well alongside more contemporary material and she has been tipped by some as a natural successor to the great traditional singer Shirley Collins, a key contributor to the English folk revival of the 1950s and 60s. Earlier this year Jackie was one of eight folk musicians chosen for the unique Cecil Sharp Project, facing the challenge of creating new works based on the life and song collecting of the father of the English folk revival, Cecil Sharp – already staged by the commissioning Shrewsbury Folk Festival it will tour next January. Jackie now also swells the ranks of the impressive Imagined Village line up and her English rose looks have even seen a range of cosmetics named after her by popular high street chain, Lush. Also joining the impressive Saturday line –up will be another award-winning young act -the high energy, much feted Jamie Smith’s Mabon. Formerly known simply as Mabon (meaning autumn equinox), the prodigiously talented JSM are fast making their unique and vibrant mark on the roots scene, led by tunesmeister and accordionist extraordinaire Jamie Smith. Mabon scooped the Best Instrumental Album of 2010 title (for their Porthcawl-recorded Live at the Grand Pavilion) in the 2011 Spiral Awards, run by top music website Spiral Earth – an album that captures all the energy and pizzazz of their acclaimed live show and includes a free bonus DVD. The album not only triggered an instant response from fans old and new but garnered an unprecedented volume of media airplay and reviews, including BBC Radio 2 and 3. Radio 2’s Mike Harding called them “a top band led by one hell of an accordion player and arranger” while Radio 3’s Mary Ann Kennedy described them as “a breath of fresh air in Welsh music” and the Financial Times praised their “fearsome reputation as a live band”. A new diversion has seen JSM weave some songs, penned by Smith, into the set -including the aptly named Yes We Sing Now (!) as well as some exciting shifts in style and sound. But it is Smith’s inspired, eclectic tunes that continue to dominate the material that delves into every Celtic corner – from their native Wales to Brittany, Scotland, Ireland, Galicia and beyond. His prolific and imaginative compositions take audiences on a magical whistle-stop Euro tour with jigs and reels jostling for space alongside other dance-related forms including Breton an dro, French mazurka, Galician muinera and even shades of klezmer in an exuberant, feelgood show. Frome is located close to Bath, Wells and Salisbury. The new winter festival will be played out at The Cheese and Grain and other town locations and is the brainchild of West Country music promoter Jan Ayers, who successfully brought a folk festival back to Bristol after 32 years this spring. Frome Folk Festival will run from 9am -11pm both days. Early Bird weekend tickets, price £58 (£48 concessions) are now on sale from the Cheese and Grain box office on (01373) 455420, online at www.cheeseandgrain.co.uk or via www.seahorsepromotions.co.uk, www.seetickets.com and www.Gigantic.com. A family weekend ticket for two adults and 2 children (aged under 15) is £190. No booking fees apply.